INCA Internet's Emergency Response Team's official blog. : [Caution] Spreading malicious files masqueraded as Facebook image. [Caution] Spreading malicious files masqueraded as Facebook image. INCA Internet response team detected malicious files disguised as sent from Facebook. Facebook is a social networking service launched in February 2004, owned and operated by Facebook, Inc. As of June 2012, Facebook has over 955 million active users, more than half of them using Facebook on a mobile device. Security threats for SNS have been increased since the number of Facebook user has grown. Therefore, Facebook users need to understand these security threats and to be careful from attachment on e-mail. Because of social engineering, an understood to mean the art of manipulating people into performing actions or divulging confidential information, is consistently used, users need to be careful from malicious behaviors. Spreading fake e-mails from Twitter or Facebook have been being found on uncertain interval. It's really classical, though, it is the strongest way to spread malicious files. Reported case on Aug. 28, 2012 is as following. To create and propagate malicious files are very intelligent. Following image was sent from on Aug. 29, 2012. Besides, receiver's mail address is hidden. 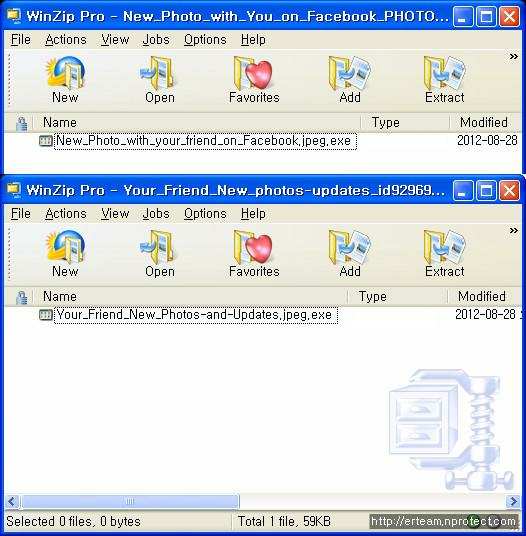 Each e-mail contains malicious file as a ZIP form, which name is "New_Photo_with_You_on_Facebook_PHOTOIDJKG3JSP0.zip" and "Your_Friend_New_photos-updates_id929690899.zip". Each ZIP file contains executable malicious file. It contains "New_Photo_with_your_friend_on_Facebook.jpeg.exe", "Your_Friend_New_Photos-and-Updates.jpeg.exe". If a user checked to hide known extension name, .exe will be invisible. Upon executed malicious file, it will create "svchost.exe" on "All Users" folder and perform malicious behaviors such as collecting or leaking device info. INCA Internet response team added these patterns to our AVS, so users are needed to update latest version for being safe from these malicious files. Spreading fake e-mails from Twitter or Facebook are really classical, though, it is the strongest way to spread malicious files. To use PC safely from security threats of these malicious attachments, we recommend you download latest security updates and obey following "Security management tips" for general users. Take a look on an article about sprint family locator app! Currently it looks like blogspot and is the top blogging platform available right now. Good evening Today I am sharing some amazing New year Photos and messages with your which you haven’t seen yet. The new year is one of the most precious festivals which we all celebrate on the first day of the year. Thank you for sharing your experience with this post. now a days various online malware and viruses are attacking on system and encrypts all the files on the computer. to decrypt needs a key and he have to pay some ransome for that. to make your files secure from these kind of malware you can get Norton setup with a product key.